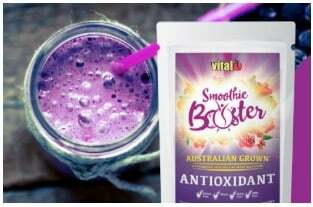 Vital Smoothie Boosters are Naturopath developed blends that will boost the beloved smoothie with densely nutritious Australian grown ingredients to support a range of specific wellness outcomes. 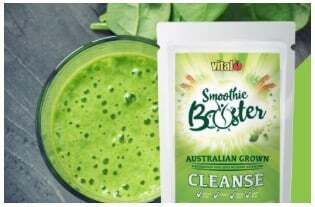 The Cleanse and alkalise blend is a selection of the best Australian natural ingredients known for their alkalising benefits to help support the body to cleanse out high levels of acidity and promote Detox. Alkalising diets have been shown to help prevent illness, and support weight management. 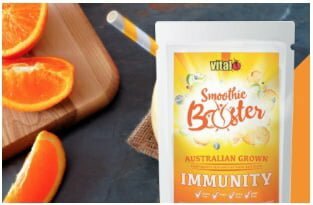 The immunity blend is a combination of ingredients selected for their broad range of benefits in supporting the bodies fight against disease. It is perfect for when you’re starting to feel run down, or during a change of season. It will help give your body essential nutrients to fight off illness. Antioxidants are powerful substances found in certain foods which can help counter the ageing damage caused by pollution, poor diet, and stress. This blend of antioxidant rich ingredients may help with slowing the appearance of wrinkles and dry skin.